Alexander Gukov, 42, of Russia, is stranded at 6200 meters on the North Ridge of Latok I (7145m) in Pakistan after his partner Sergey Glazunov, 26, fell to his death while rappelling on July 25. Yesterday a rescue team that includes Andrzej Bargiel, David Gottler and Herve Barmasse was assembled, but so far the mission has been grounded because of unfavorable weather. Plan A is to extract Gukov via an "external helicopter suspension," according to a Mountain.RU report translated by Karen Freund for Alpinist. If that doesn't work, rescuers "will be taken by helicopter to the point nearest to [Gukov] and begin moving towards him." Bargiel is fresh off his successful ski descent from the summit of K2 (8611m) on July 22. Gottler and Barmasse are coming from an expedition on Gasherbrum II (8034). Mountain.RU Editor Anna Piunova is helping to coordinate the rescue. She told Alpinist that Gukov and Glazunov had started their climb 14 days ago and were already running low on rations when the accident happened. Earlier today, Piunova told Alpinist, "Alex [Gukov] sounds depressed; he ran out of food, and the forecast is bad until July 29. Helicopters are ready. We need a little bit of luck." The North Ridge of Latok I is legendary among alpinists because it has remained unclimbed since Jim Donini, Michael Kennedy, George Lowe and Jeff Lowe nearly succeeded on the long, committing ridge in 1978; they came within a few hundred meters of the summit but they retreated after Jeff Lowe nearly died from a sudden onset of altitude sickness. "It took us four days to rappel the ridge from our high point," Kennedy told Alpinist. "There was rockfall coming down all the time on either side of the ridge, so we planned to descend the way we came up (instead of going up and over the summit to get off)—we had a fair amount of hardware with us and cached some of it on the way up, and used flagging tape to mark caches and any anchors we left in place." They also cached food, which they entirely devoured in about 10 minutes when they reached it on their way down—"we were starving," Kennedy said. "It is a super serious place." Many more elite alpinists have tried to complete the line over the years, but so far no one has matched the original high point from 1978. 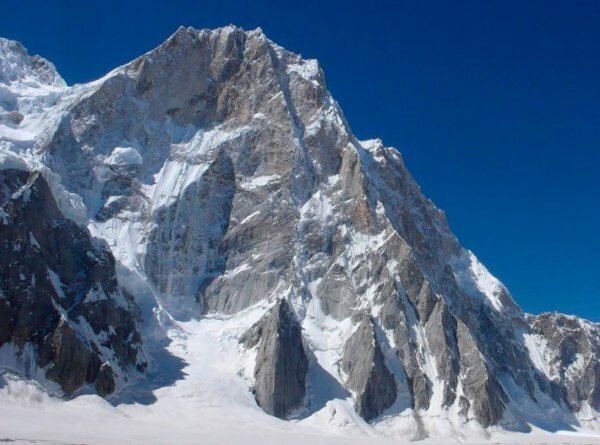 The American Alpine Journal reports that there have been "more than two dozen attempts" on the ridge and Gukov was part of a team last year that reached the highest point reached since 1978. He received a Piolet d'Or in 2015 for completing the first ascent of the direct southwest face of Thamserku (6618m) in Nepal with Alexey Lonchinsky in 2014. According to the translated Mountain.RU report, Gukov and Glazunov were at 5512 meters on July 15, when they discarded gear that was "too heavy." They continued toward the summit with five days of food. Periods of snow punctuated brief patches of clear weather as they pressed on. Meanwhile, their teammates Viktor Koval, Konstantin Markevich and Aleksandr Parfyonov were trying another route on the mountain, but were encountering problems with avalanches and rockfall; they stayed in radio contact with Gukov and Glazunov, and kept an eye on their position when the weather was clear enough. Gukov and Glazunov "headed out to storm the summit" without bivy equipment on July 22, according to Mountain.RU. Gukov reported later that day: "We couldn't reach the summit. Aid climbed two pitches. Will try tomorrow." By that evening, Koval reported that the weather worsened and that the summit was no longer visible. Had an agreement with Sanya Gukov that if the battery ran out and things were bad, he'd send SOS and altitude, but next message said "I NEED HELP," and then "I NEED TO BE EVACUATED." Via Iridium: "Seryoga fell. I'm hanging on the wall without equipment." At 8:20 a.m. July 26, a pilot confirmed that Glazunov was dead after seeing the body "in foothills near base camp." At 10:05 a.m. Koval reported, "There are stones flying everywhere, every 5 minutes. Impossible to go to the ridge." By noon, the rescue team was prepared to fly to base camp, but it was determined that a helicopter would not be able to deliver a rescuer to Latok that day. At 5:25 p.m. they'd lost contact with Gukov, assuming that his radio battery had died. Kennedy said the conditions on the mountain during their attempt on the North Ridge 40 years ago were probably much different from what most climbers have encountered since then. "When we were there it was dry and hot, probably drier than many of the subsequent years," he said. "The cornices weren't as bad, and we had decent snow and neve." For descending, "rock anchors were key," Kennedy said, "but we didn't know about V-thread anchors back then, and instead we left ice screws." Nowadays, there are probably old anchors to be found along the ridge, "but finding them on such big terrain after recent snowfall would be hard," Kennedy said. A bright spot for Gukov is that his position appears to be below a long, horizontal knife-edge that presented a memorable obstacle for Kennedy and his friends on the upper half of the route. "We had six ropes and were moving capsule style," Kennedy said. "We left two ropes on that horizontal section to get across it safely on the descent." 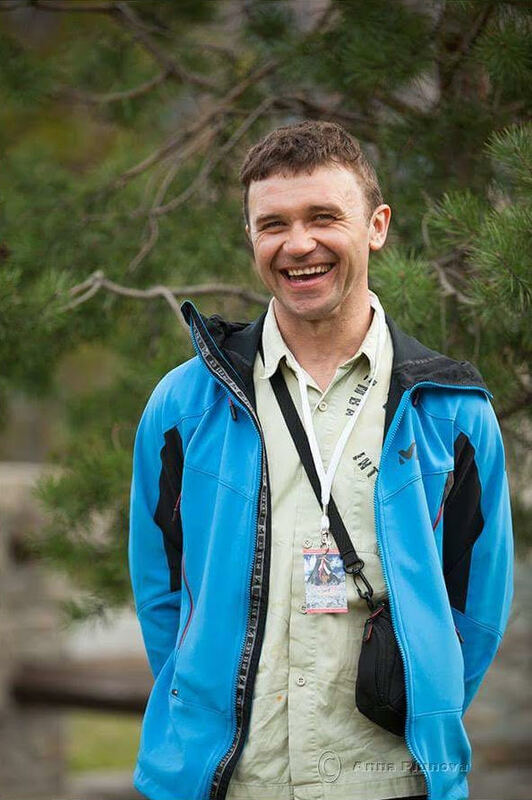 Sergey Glazunov was known to climb with his brother, Eugeny, and the two completed a climb on Chon-tor in 2016 that is noted in the 2018 AAJ. Eugeny was originally planning to join the Latok expedition as well but he had to cancel one week before his departure, which led to a change in the team's tactics, Piunova said. 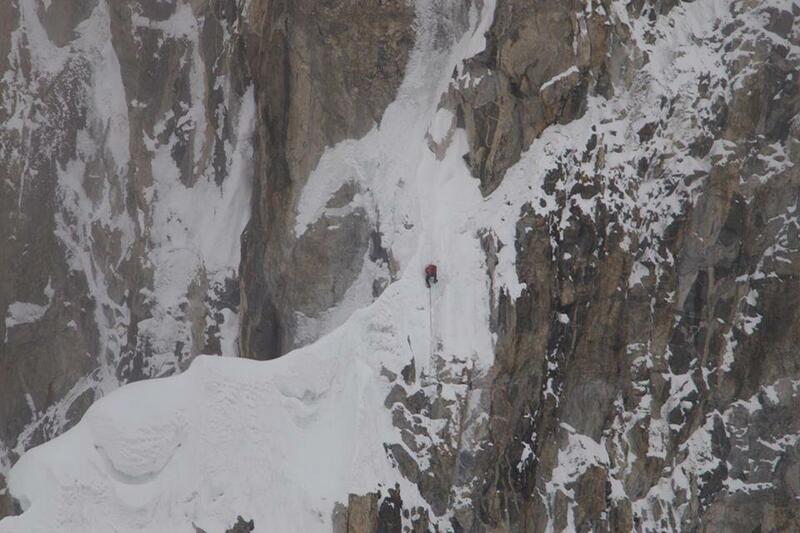 Update, July 30: The "Plan B" rescue option of depositing climbers on the mountain to reach Gukov has been ruled out. Plan A, extracting Gukov via a longline helicopter rescue, remains the primary goal. Weather remains less than ideal. Helicopters have been able to fly near Gukov's elevation on the mountain but visibility has not been good enough to attempt the extraction. Second update, July 30: Piunova has just indicated on Facebook that the rescue was successful, simply posting, "Saved!!!" She later confirmed for Alpinist that Gukov and the rescuers were safely down from the mountain, and that Gukov's next destination was a hospital for injuries that weren't immediately specified. "All these efforts over seven days...were not in vain!" she said. A follow-up story with more details about the rescue can be found here. A very small correction, Goettler and Barmasse are coming from GIV not GII, but the two share the same BC. Fingers crossed and very best of luck to all.